The Happy Recap: To Trade Or Not To Trade? Although the current trade rumor of the Minnesota Twins asking for Fernando Martinez, Carlos Gomez, Philip Humber, Kevin Mulvey and Deolis Guerra is probably not true, let's discuss it anyway. I have said many times before that the Mets should aggressively pursue Santana because he would push this team over the top from good, to possible World Series Champion. And although your 5 best prospects is a hefty price to pay, if you could guarantee a World Series victory I would do it right now. I'm not overly concerned that some of these prospects would become stars, because Santana already is a star, my worry is that depleting the farm system in this way would damage the organization for years to come. First of all, without Gomez or Martinez that means Endy Chavez in left field for 50 games this season while Alou is hurt. And for 2009, the Mets will probably need to replace Alou and maybe even Church (if he's as unproductive as I think he will be) and without Martinez or Gomez in the pipeline that will force the Mets to bring in two high-priced outfielders. 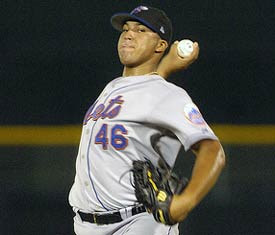 And if Pedro and El Duque retire or break down replacements for them (this season and beyond) will also be expensive. So my evaluation of the trade is this: if it works out this season, great, but if it doesn't it would force the Mets into several (probably overpriced) free agents, a road the Mets have gone down before, unsuccessfully. I think the team's longterm future would be better protected by trading Reyes for Santana because you'd still have your top prospects around for the future. This does represent a slight change in my philosophy, but not because I've changed my stance on Santana but because I think Gomez and Martinez can't be included in the same deal, especially not with the top 3 pitching prospects in the organization. for all the reasons you mentioned, they can't make that trade. If they make it and it works, that's phenomenal, i would love a World Series Victory for my boys. But if it doesn't you'll have Wright, Reyes, and Santana with a band of voer priced mediocre talent to open the 2009 season at Citi Field. They can't take that chance. Of course, they could offset that by firing Willie and bringing me back.